Many people use a hardware wallet to store their private cryptocurrencies offline. Think: portable hard drive for your digital assets. A hardware wallet, also known as a “cold wallet” or “cold storage,” is distinguished from software wallets or “hot wallets,” which are based on the Internet or on your computer. Hardware wallets are more secure than software wallets because the private keys used to access your cryptocurrency are embedded onto the microcontroller of the device itself, making them impossible to hack. If you have a significant investment in cryptocurrency, hardware wallets are a necessity for keeping your coins safe and away from the possibility of a cryptocurrency exchange getting hacked. Our research team ranked the the best hardware wallets of 2018. CoolWallet is a rather unique hardware wallet that is designed to look and feel like a credit card. It features an LCD screen that is used to input passwords and read off seeds, making it impossible for anyone to steal them off you unless they’re physically watching over your shoulder. Hardware wallets with screens are exceptionally useful because it means that they can be used even with computers that have been infected with malware, since all transactions are displayed on the screen. CoolWallet also boasts a control button that allows you to manage your cryptocurrencies easily, and is also built to be resilient, as it is bendable up to 15 degrees and is heat resistant up to 140 degrees Fahrenheit (60 degrees Celsius). CoolWallet is oriented for mobile users instead of computer users, so the setup process might be cumbersome for some. The device requires you to download an app to your smartphone, then pair your phone with your CoolWallet. Additionally, some users have reported glitches and bugs when setting up their CoolWallets. Finally, CoolWallet only supports Bitcoin at the moment, meaning you can’t use it to store other cryptocurrencies. At a price of $119, CoolWallet is a decent option for Bitcoin HODLers who want a cheap and secure way to protect their investments. Its resilient, compact design and ease of use are definite selling points for newbies. However, more serious cryptocurrency enthusiasts may want to pass on CoolWallet due to its lack of altcoin support, its glitchy setup, and its mobile-centric design. Case is a self-contained hardware wallet that boasts a number of unique features, from fingerprint swiping to multisig security. Case’s most important feature is the way it stores users’ private keys. Of the three keys used by its multisig system, one is hardwired into the wallet itself, another is stored on Case’s servers, and the third is held by Third Key Solutions, a trusted cryptocurrency security firm, though users can override this and carry the third key themselves. Setting up the device via the Internet is easy and fingerprint swiping adds an extra level of security. Additionally, Case has built-in support for the Celery exchange, allowing users to buy and sell Bitcoin directly from their wallets, without having to transfer anything to a online “hot wallet” or exchange wallet. This is a nice option for traders. Downsides to Case include the inability to remove the first private key from the device—which means that users will not be able to access their money should Case go out of business—as well as a lack of altcoin support. Case is also priced somewhat steeply, at $199. Case’s security measures, fingerprint support, and built-in exchange functionality make it a worthwhile option for Bitcoin traders and HODLers, though more advanced users will want to look elsewhere. The Cryo Card and Cryo Coin are two products from CryoBit that function similarly, offering resilient and secure cold storage for Bitcoins. The Cryo Card is a credit card-sized hardware wallet featuring a Bitcoin address printed on the front and an encrypted private key on the back. Users who purchase a Cryo Card offer their existing wallet information when checking out, as the card itself has no interface. The Cryo Card is manufactured from stainless steel, making it the toughest hardware wallet we’ve found, able to survive just about any form of abuse. The Cryo Coin is roughly the same as the Cryo Card, only it is slightly less expensive, as it is manufactured from nickel-coated brass. Due to their lack of many of the features of most hardware wallets—you can’t plug them into a computer, they have no interface, and all transactions must be done manually—the Cryo Card and Cryo Coin are not recommended for anyone who needs easy access to their funds. Additionally, the Cryo Card and Cryo Coin only support Bitcoin at the moment, making them useless for anyone who needs to store other cryptocurrencies. However, for users who want a low-tech solution when it comes to crypto storage, the Cryo Card and Cryo Coin are worth a look. Their low price—the Cryo Card retails for $50 and the Cryo Coin for $30—belies their solid construction and ability to withstand punishment, making them good long-term ways to store your Bitcoins. OpenDime is a hardware wallet that functions as a hardware bearer bond or “credit stick,” and it is priced quite inexpensively, at $40 for a pack of three. OpenDime’s unique feature is a physical seal on the wallet itself that secures the Bitcoins contained on it against being hacked or transferred. When the user is ready to spend the Bitcoin online, they merely need to break the seal, which reveals the private key and allows the Bitcoin to be used. An unsealed OpenDime allows the user to conduct as many in-person Bitcoin transactions as they want. Because of this seal, OpenDime has been likened to a piggy bank, in that it needs to be destroyed in order for the Bitcoin to be used. While seemingly wasteful, this security feature makes OpenDime wallets a great long-term store of value, since users merely need to check the seal to determine whether the device has been compromised. OpenDime wallets are also great for person-to-person transactions, since these transactions take place outside of the blockchain and the Bitcoin contained in each wallet will be secure so long as the seal remains unbroken. Like the wallets previously mentioned on this list, OpenDime does not support altcoins. Additionally, its nature as a bearer bond means it cannot be used for online transactions, at least not without destroying the seal and rendering the device useless. However, OpenDime’s inexpensive price and unique security features make it a worthwhile option for those looking to hoard Bitcoin over the long term. Digital Bitbox is a USB stick hardware wallet notable for its altcoin support and wide variety of features. A minimalistic device similar to the Ledger HW.1, Digital Bitbox is notable for its microSD support, allowing users to make offline backups of their wallets with a microSD card. Digital Bitbox also stores users’ private keys on a high-security chip that boasts a lifespan in excess of fifty years, ensuring that users will never lose access to their funds. Most notably, Digital Bitbox boasts support for cryptocurrencies other than Bitcoin. At the moment, Digital Bitbox supports Bitcoin, Ethereum, and Ethereum Classic as well as ERC20 tokens, making it a good option for users who need to store these coins offline. Finally, Digital Bitbox is priced at €59 (roughly $75), making it an affordable option as well. Digital Bitbox’s primary downside is the lack of a display, requiring it to be paired with a computer in order to be used at all. However, its combination of accessibility, security, afforability, and altcoin support make it one of the strongest options available for cryptocurrency users. BitLox is a luxury hardware wallet designed for Bitcoin HODLers and others with cash to spare. Its suite of elite features sets it apart from the competition in myriad ways. Similarly to CoolWallet, BitLox is designed to resemble a credit card, with a thin titanium build that is resistant to heat and water damage. BitLox also features a unique e-paper display akin to the Amazon Kindle that consumes very little battery power and functions even when the device is powered off. Most impressively, BitLox features a full keyboard, allowing users to make transactions without the use of a computer. BitLox also boasts a large number of security features, such as an emergency PIN that irreversibly wipes all user data from the unit and the ability to generate over a hundred wallets with each unit. BitLox also features a number of convenience options, such as an internal calculator that automatically displays fees when making transactions, as well as support for multiple languages. BitLox is also compatible with Tor, allowing users to make transactions in total anonymity. Where BitLox largely falters is its price. Its least expensive variant, the BitLox Advanced, retails for $199, while more comprehensive models are priced even higher. Additionally, BitLox currently lacks support for cryptocurrencies other than Bitcoin, though the developers claim that they will be adding altcoin and Ethereum support soon. For Bitcoin HODLers who are looking for the ultimate in features and luxury, BitLox may be worth its steep price tag. However, altcoin users and more casual crypto traders may want to look elsewhere due to BitLox’s high price. KeepKey is a hardware wallet that is widely recognized as one of the best on the market due to its combination of security and convenience features and reasonable pricing. It is based off of TREZOR’s hardware and firmware, but boasts a heavier aluminum design for added durability. One of KeepKey’s most distinguishing features is its privacy and security. It supports seeds of up to 24 words in length for added insulation against hackers and also supports PINs and number randomization. KeepKey uses a Google Chrome plugin to allow users to manage their wallets via a computer, making the wallet compatible with any device so long as it is capable of running Chrome. KeepKey also boasts a high-quality LCD screen. KeepKey’s most notable feature is its strong altcoin support. Indeed, KeepKey is currently compatible with all altcoins currently available on the market, including Ethereum, Litecoin, and Bitcoin Cash, provided the user pairs their KeepKey with a compatible software wallet. The one major downside to KeepKey is its $99 price tag, which may be out of the range of some buyers. However, if you want a reliable, secure hardware wallet that is compatible with a wide variety of altcoins, KeepKey is easily one of the best options available to you. 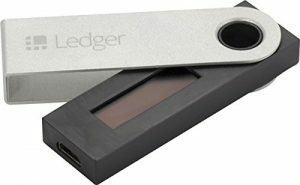 The Ledger Nano S is one of Ledger’s most recognized and popular hardware wallets due to its reliability, security, speed, and features. Unlike the discontinued Ledger HW.1, the Ledger Nano S comes with a screen, making it possible to use the wallet with a computer even if that computer is infected with malware. The wallet also boasts two buttons which must be pressed at the same time in order to confirm a payment, making it impossible for hackers to hijack the Ledger Nano S and use it to make unauthorized transactions. Like other wallets, the Ledger Nano S boasts PIN support for added privacy when using it. However, it lacks passphrase support, which may be a dealbreaker for more security-conscious users. Additionally, unlike most hardware wallets, the Ledger Nano S does not include a battery, meaning that it will shut down when not connected to an external power source. Like KeepKey, the Ledger Nano S supports Bitcoin, Ethereum, and a wide variety of altcoins, giving it a flexibility that many hardware wallets lack. The Ledger Nano S’ steep price of $95, its lack of passphrase support, and its lack of an internal battery are its primary downsides and may dissuade security-focused users and budget-conscious customers from buying it. However, the Ledger Nano S’ quality screen, strong security, and extensive altcoin support make it one of the finest hardware wallets available, and one of our top picks for 2018. TREZOR is a high-end hardware wallet that offers one of the best blends of security and accessibility of any wallet on the market today. TREZOR’s main distinguishing features are its PIN protection system and screen. Like most hardware wallets, TREZOR requires a PIN to be inputted during setup and used every time a transaction is made. Every time the wrong PIN is entered into the device, it raises the amount of time needed before inputting it again by a power of two. For example, entering 30 incorrect PIN entries would take 15 years. This makes TREZOR one of the most secure hardware wallets available. In addition to standard seed technology, TREZOR also allows users to add a passphrase, which further adds to the security of their crypto stash. The wallet can also be set up via TREZOR’s official website, a Google Chrome plugin, and via command line for experienced users. Users who care about security should use the latter two options (and use the Chrome plugin on an offline computer), as there is a small risk of data leaking when using TREZOR’s website. Finally, TREZOR is notable for its wide variety of supported altcoins, making it an extremely good option for those with diversified portfolios. 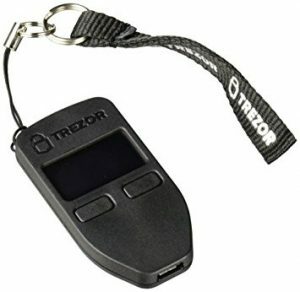 TREZOR is often compared to Ledger Blue, with the latter slightly edging out the former due to its greater breadth of features and superior interface. Both TREZOR and Ledger Blue are quite pricey, so lower-end users might prefer a less expensive hardware wallet. However, TREZOR’s suite of features and its slick, quality design make it impossible to ignore. If you’re looking for maximum flexibility and security in your hardware wallet, TREZOR is one of the best choices you can make. The Ledger Blue is easily the most advanced hardware wallet currently available, and one of the best in terms of quality, security, and features. The Ledger Blue sets itself apart from the competition by having a more advanced, smartphone-like design, with a high-quality touchscreen interface. It is easy to set up and offers seeds of up to 24 words in length for added security. It is also compatible with numerous desktop apps and software wallets, allowing you maximum flexibility in accessing and using your money. Additionally, the Ledger Blue is secured against virtually all forms of tampering and hacking. Unlike other hardware wallets, the Ledger Blue does not ship with anti-tampering seals, because it doesn’t need them: due to cryptographic technology included in the wallet’s design, external tampering is ineffective. The Ledger Blue will also deactivate after three failed login attempts, while users who lose their Ledger Blues can merely buy a new one, then use their 24-word seed phrase to regain access to their funds. The Ledger Blue is also immunized to malware attacks by virtue of the fact that it has a screen, meaning that you can set it up without connecting it to a computer and risking infecting it. Like Ledger’s other wallets, the Ledger Blue also features extensive support for Bitcoin, Ethereum, and altcoins. The primary downside of the Ledger Blue is its price: at $199, it may be out of the range of most buyers. This is due to the touchscreen and tablet technology the wallet uses, which is head-and-shoulders above virtually all other hardware wallets. However, for serious crypto users who have money to spend, the Ledger Blue is an unbeatable wallet, with enough security and other features to satisfy any users. 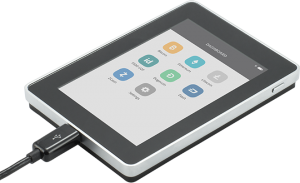 Newbies may also want to consider the Ledger Blue, as its touchscreen interface makes it considerably easier to set up and use than any other hardware wallet. Hardware wallets represent a significant investment for any cryptocurrency user due to their cost and what they represent. While many people have dabbled in cryptocurrency through day trading and other means, purchasing a hardware wallet means you are serious about protecting the integrity of your money. While keeping small amounts of currency on software wallets and exchanges is okay, if you’re a long-term HODLer or investor, you need a hardware wallet to ensure that your assets don’t get hacked or stolen. When looking for a hardware wallet, you need to consider security, flexibility, and usability above all else. A hardware wallet needs to be capable of protecting your assets from hackers and phishers, it should be easy to set up and use, and it should offer support for as many different cryptocurrencies as possible. Effectively, hardware wallets need to be as easy to use as regular wallets are. If you’re ready to take the next step in your crypto adventures and purchase a hardware wallet, we highly recommend the wallets listed above. You can be sure that your assets will be safe if you use any of them. They also offer a different variety of features and are priced accordingly, so you can find a wallet that meets your needs and fits within your budget. Given the nature of cryptocurrency, you cannot afford to take risks with your assets. A hardware wallet will allow you to safely store your crypto holdings while making it possible for you to buy and sell them and use them in business transactions. No matter your level of involvement in cryptocurrency, hardware wallets are a worthwhile investment that will pay for themselves many times over.